We’re less than a month away from the premiere of Syfy’s Helix, but the latest trailer still just looks like a greatest hits reel from other well-known science fiction properties. You’ve got the remote, snowy location of John Carpenter’s The Thing. The mysterious black ooze infecting people, just like in The X-Files. The biomedical trappings of any number of pandemic thrillers, and the angry infected riff on everything from Dr. Jekyll to zombies. I’m not saying Helix will be bad — I’ve heard some positive early buzz, and showrunner Ronald D. Moore (Battlestar Galactica) still earns my optimism — but I keep waiting for the first trailer or clip that blows me away and looks like more than the sum of its overly familiar parts…but this ain’t it. “Play God. Pay The Price.” In 2014, Ronald D. Moore will release two science fiction TV shows for two prominent cable networks. The first is the historical fiction/time travel series Outlander for the premium network Starz. 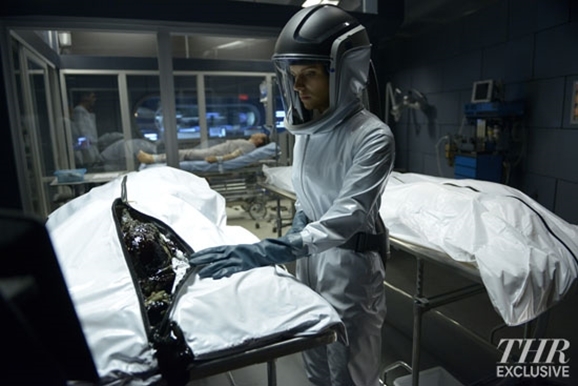 The other is the sci-fi thriller Helix for Syfy. The network has released a new trailer for Helix, which makes the TV series look more and more like the TV version of John Carpenter’s The Thing. Exclusive to EW, the Helix teaser trailer shows off more of the cast and the series’ Arctic backdrop. It also features the mysterious black goo we’ve seen in earlier photos, and which appears to lurk within the underground laboratory’s walls. Ronald D. Moore‘s new show Helix may be set in the Arctic Circle, but the series is being filmed in Montreal, Canada, where some pretty elaborate corridors and labs have been designed to set the scene for the upcoming Syfy drama. I had the opportunity to visit the set of Helix and, in addition to getting to hear from the cast, as well as co-executive producer Cameron Porsandeh and director/executive producer Brad Turner, we were also allowed to snap photos to our heart’s content. So I have a lot to share with you about this little adventure up north. Syfy’s Digital Press Tour 2013 actually started with a tour of Being Human, and you can read all about that here. We moved on to Helix from there, visiting two separate locations, the first of which is what I’m going to talk about here. But before we get to that, what’s Helix about? Science fiction TV icon Ronald D. Moore is busy with two new TV shows coming in 2014. The first is a romance sci-fi genre hybrid set in 18th Century Scotland called Outlander, while the other is a sci-fi thriller set in the icy cold of the Arctic called Helix. The latter is quickly coming together for 2014, as it recently cast another sci-fi icon, in the person of Jeri Ryan, for a multi-episode story arc. After the acclaimed run and controversial ending of Syfy’s Battlestar Galactica, showrunner Ronald D. Moore followed things up with several TV projects that didn’t meet with much luck. The BSG prequel series Caprica only last one season, and Moore’s Virtuality TV movie and 17th Precinct pilots were pretty much non-starters. Some four years after BSG wrapped up, however, Moore is returning to the airwaves with gusto, shepherding not one, but two new series: the time-travel historical romance series Outlander for Starz, and the sci-fi thriller Helix for Syfy. The latter is set to premiere sometime in 2014, and now a new set of images from the show reveal we’re in for high levels of goop, not to mention some serious X-Files flashbacks.